Free! Bring fave Dish or Dessert or Drink & Tacky Ornament! It's a potluck so please bring your fave dish, appetizer, dessert, drink, etc. Don't forget a tacky ornament too! This is the party of the YEAR! 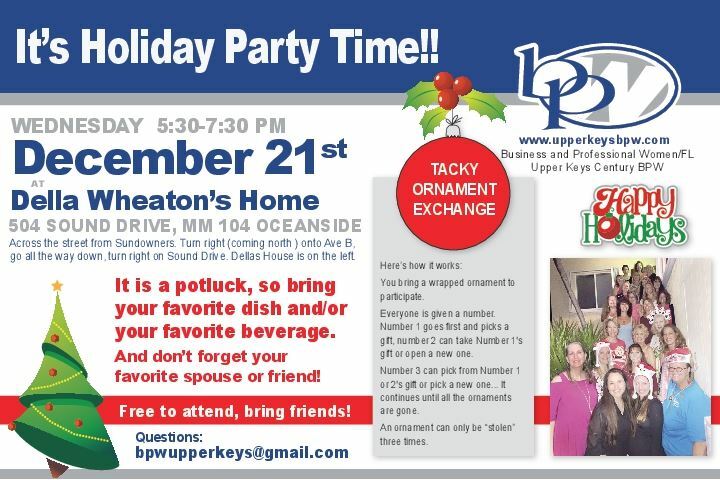 Della has graciously invited all Upper Keys BPW members to enjoy fellowship and cheer in her home. Bring your favorite dish or libation and a tacky ornament for our exchange. Let's come together and share the joy of the Holidays.